Zhejiang Changzheng Vocational & Technical College is approved by The People’s Government of Zhejiang Province and filed by National Education Ministry. Revolutionary Committee of Zhejiang Kuomintang and Jiahong Holding Group Co. Ltd. are jointly operating this full-time general higher institution. CZU is located in Xiaoheshan Advanced Education Park of Xihu District in Hangzhou City, where Zhejiang Industry University, Zhejiang Technical College, and Zhejiang Foreign Language College can be found as well. CZU has rich educational resources, enjoys convenient transportation, and has good academic atmosphere. The stunning campus is very close to Wuchaoshan National Forest Park and Xixi National Wetland Park. On the campus, there are classroom buildings, experience training buildings, student dormitories, a multi-functional gymnasium, a library possessing over 1，152 thousands books, 6 in-campus practice bases and 105 school laboratories. The institute has signed framework agreements about cooperation in education with industry associations such as Hangzhou ICC, and has built more than 250 off-campus practice bases, respectively, with Alibaba, S.F.Express, Gome Group, Zhejiang Tianhuang Technical Industrial Ltd., Hangzhou Wanshili Trading Ltd., Shenzhen Anju Business Accounting Agency Ltd., and Wal-Mart Co. Ltd. in East China. CZU is organized into 5 second-level college schools – Finance and Accounting, Economics, Management, Humanities, and Computer & Information Techniques. There are additional 4 independent faculties including Foundation Department, Teaching Department of Political Theory, Experimental Practice Center and School of Continuing Education. 28 specialties are offered in our college, along with a wide range of courses. International Economics & Trades, Electric Business, Financial Management, Human Resources Management, Software Technology, and Business English are the featured specialties, while Accounting Course is honored the featured program in provincial level. CZU has a group of faculty members who bring academic rigor and real-world experience to the classroom. Among full-time teachers, 183 members have senior professional titles, and more than 307 hold master degrees. Currently, CZU has 10,800 full-time students and over 2600 adult students and distance education students. Furthermore, there are more than 5000 persons-time involved in the trainings every year which exactly meet varies of levels of social needs. 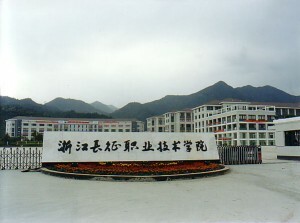 Adhering to school motto of self-discipline and social commitment, standing out by school running features of serving medium, small, and micro private companies, CZU has actively adapted to the local economic development by focusing on providing skilled technical talents with high culture quality, professional quality, and work ethic. In the past 33 years, more than 330 thousand graduates received their degrees or diplomas from CZU. The graduates are sought after by both industry and government.